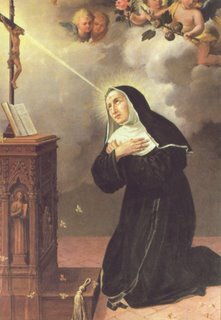 Today Holy Mother Church celebrates the feast day of St. Rita of Cascia. The American Catholic Saint of the Day page for her shares that her life was far from what she had wished for, and far from ideal. Yet in every stage, she lived her Baptismal call to holiness. You see, she married an abusive and promiscuous man because her father wanted her to do it. It was a difficult life for her, far from ideal, and it was a situation in which others would have lost hope. For this reason, she is the patron saint of parenthood and, along with St. Jude, hopeless causes. Rita always wanted to share in the suffering of Christ, and so she offered everything up and suffered in union with him. She had a wound on her head (circular, as if she were wearing a crown of thorns), that lasted 15 years. One tradition for this feast day is the blessing of roses. Story goes that when she was about to die, Rita asked a visitor to bring her a rose from the garden of her birthplace along with two figs. It was cold and no one expected that any flowers would have bloomed by this point. But the visitor went back and found a rosebush fully bloomed and two riper figs on a tree with no leaves. This entry was posted in Prayer, Reflections, Saints. Bookmark the permalink. ← "Your grief will become joy"
I really like that prayer.